Ultimately, these technologies promise to make what the developers hope will be the “newest and most technologically advanced arena in the National Basketball Association, according to The New York Times. Soon, you’ll be able to walk from a luxury hotel directly to a basketball game. The new arena’s aircraft hangar doors will open onto a public square anchored by a luxury hotel. That public square is also expected to have more than one million square feet of retail, recreation, and office space. The old Sacramento Kings arena, Sleep Train Arena, had a capacity of 17,300. The Golden 1 Center provides a modest upgrade, allowing for a total of 17,500 fans for NBA games. The arena will also have more luxury suites than the Sleep Train Arena. That capacity, by the way, will expand to 19,000 people to host concerts. The 17,500-seat capacity makes the Golden 1 Center the second smallest stadium in the Association (the same spot occupied by Sleep Train Arena). The only arena smaller is the Smoothie King Center, where the Pelicans play. The third smallest arena, the Nets’ Barclays Center, has a capacity of 17,732. The Golden 1 Center itself will cost an estimated total of $500 million to build. The entire complex, including the public square and the surrounding buildings, is estimated to clock in at a total price of $1 billion. Golden 1 Credit Union will cover a good chunk of the $1 billion building costs. The union is paying $120 million over the next 20 years to acquire the rights to the arena. The cost of the arena has faced some controversy from local economists, who say that publically funded arenas rarely make a return on their investment, and that the economic benefits rarely extend outside of the neighborhoods immediately surrounding the arena. 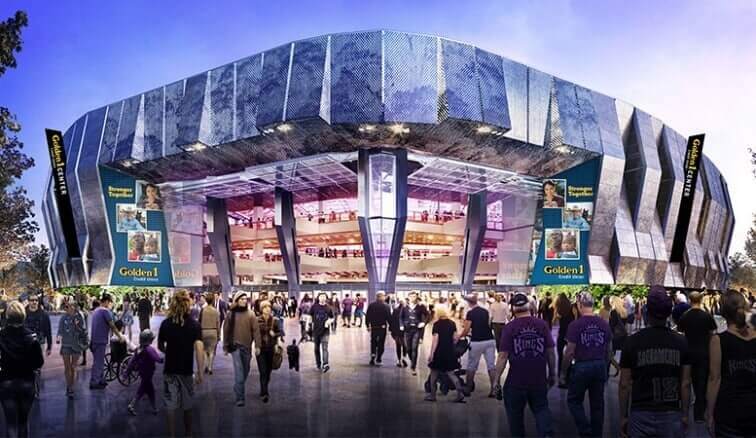 A small group of Sacramento residents objected to the use of public funds to build the arena, although the group failed to gain enough signatures to hold a referendum on the project. Sacramento-area taxpayers, by the way, paid a total of $255 million in public funds to build the Golden 1 Center. If you know the area where the arena is being built (and nobody knows this area better than Sacramento moving company Fuller Moving Services), then you know that the lot was previously occupied by an indoor shopping mall that was built in 1971. The mall had faced declining sales and rent in recent years. The new arena and the surrounding buildings are expected to revitalize the local economy in a way that the underperforming shopping mall never could. The Golden 1 Center will host its first concert on October 15, 2016, when Maroon 5 comes to town as part of their 2016 North American tour. Meanwhile, the Sacramento Kings are scheduled to start their 2016-2017 season at the arena. The arena will also host the first and second rounds of the 2017 NCAA Division I Men’s Basketball Tournament, taking place on March 17 and 19, 2017.